Great Divide's Yeti series of stouts is a joy and a wonder. 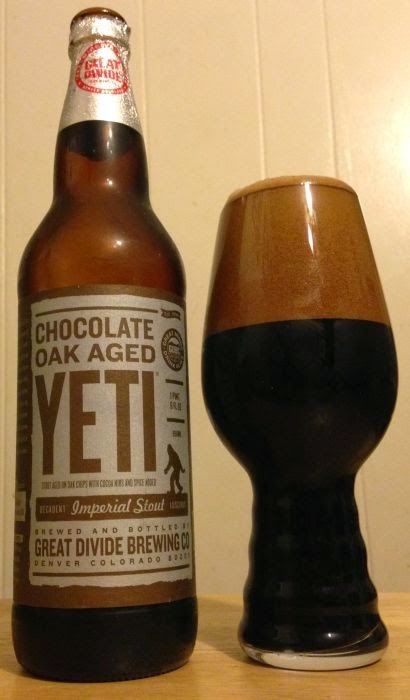 For instance, Chocolate Oak Aged Yeti Imperial Stout. This beer pours thick and black as midnight. The head is huge, foamy, and a maroon/brown color. The aroma is baker's chocolate, caramel, booze... it isn't distinctly different from the espresso oak aged version of Yeti, and that's not a bad thing at all. Like the espresso version, this one is sweet and rich up front, but not sweet enough to make me tired of it. And that familiar, bitter explosion at the end is there in all it's glory. My palate isn't discerning enough to tell a lot of difference between this and Espresso Oak Aged Yeti, but I love them both. No complaints. Great Divide just keeps hitting the bull's eye.